This year, we are excited to be hosting our annual Easter Carnival once again! Every year, the Easter Carnival is a time for celebration and fun for all ages – and this year is sure to be no different! As always, the carnival will feature lots of exciting games, fun photo opportunities and a moon bounce. We will be serving hot dogs and cotton candy throughout the event, allowing families to have a nice picnic in our outdoor bench area. The true highlights of the carnival will be the Easter Egg Hunt, an appearance of Elena of Avalon and Cinderella, and pictures with the Easter Bunny. No matter what age you are, the Easter Carnival will be a wonderful family event! The Easter Carnival will be the first of many events happening in the coming weeks and it will be a great way for families to come together and celebrate the season. Want to know more about what else is happening around Sterling this Easter? Check out this page with all of the details for our Easter Cantata, Holy Week Services and Easter Sunday. 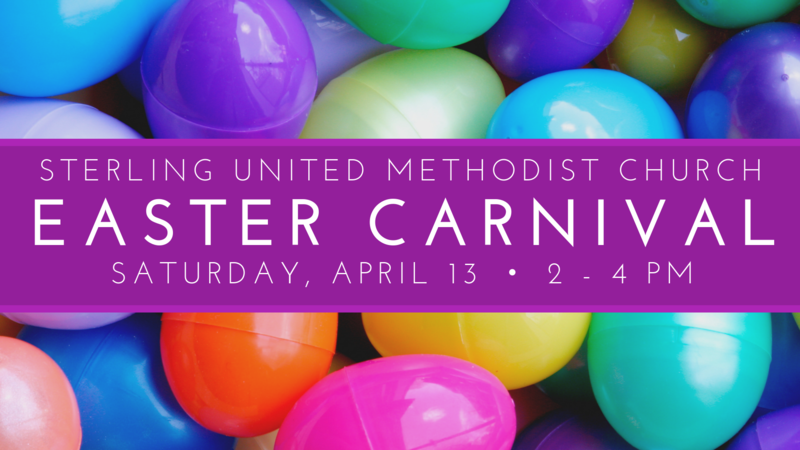 Are you interested in serving the community during the Easter Carnival? Click here to learn about all of the volunteering and donation opportunities for the Carnival.